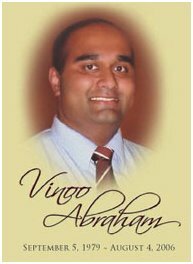 We would like to dedicate this section of IndaPhatFarm.com to the life & memory of Vinoo Abraham. It is our hope that this section will help to honor his life and testimony. Please use the form at the bottom of this page to submit testimonials about VInoo. Vinoo Oommen Abraham was born on September 5, 1979, into a Pentecostal home in Adoor, India. As a young boy in Kuwait, Vinoo demonstrated a thirst for knowledge, excelled academically, and loved to participate in various school clubs and activities. He was a gifted artist who found joy in using his talents to bring pleasure and happiness to his loved ones. It was also at this time that his love for flying grew out of frequent visits he made to his father's work place at the airport. In April, 1995, Vinoo, his parents, and his younger brother Vineet, immigrated to Canada. Upon settling into life in Canada, Vinoo took on any responsibilities his parents asked of him; to driving his mother to work to helping his father manage his business. His yearning for God, which began in Kuwait where he was baptized and filled with the Holy Spirit, was also evident in Canada where he was an active member in Grace New Convenant Pentecostal Church. He was involved in music, transportation, and Sunday School ministries. In addition to his passion for God, Vinoo was devoted to his family and loved spending quality time with them. Vinoo married his lovely wife, Janey, on August 9, 2003. Their love for each other was strong. On February 13, 2006, God blessed them with a wonderful son, Micah, whose smile still reflects his father's joy and happiness. Vinoo's dream of flying became a reality in September 2005 when he was accepted into flight school. He completed his first solo flight on February 7, 2006 and was weeks away from receiving his Private Pilot's license. On August 4, 2006, on his flight back to the airport after a routine training exercise, Vinoo met with an accident and God took him home. Although he will be greatly missed by his friends and family, we are comforted knowing that VInoo is in the presence of God. He leaves behind his wife Janey, son Micah, parents Roy & Dolly, brother Vineet, and Janey's parents Roy & Elcy, along with countless family and friends. We will never forget. You can contact Janey Abraham at janeyabraham@yahoo.ca. You can contact Vineet Abraham at vineetabraham@hotmail.com. Please send us your testimonials about Vinoo's life via this online request form.